Once, there was a prime minister of Great Britain. I reckon he was somewhat famous. He was prime minister during World War II and was one of the most important people of the 20th Century. You may have heard his name. It was Winston Churchill. Currently, there is a famous racetrack in Kentucky. 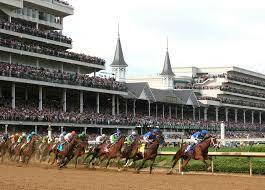 In fact, its most famous race is called the Kentucky Derby and has been run since the 1870s. You may have heard of the racetrack. It is called Churchill Downs. Why am I writing about all of this Churchill stuff? Because I live on a street named Churchill, and nobody knows how to spell it. I have seen it spelled as Churchhill, and I have seen it spelled as Church Hill. Heck, our city, which owns the street and takes care of it, spells it Church Hill. Our water bill says Church Hill, and our property tax card says Church Hill. I wonder if I have to pay those since I do not live on Church Hill. Since no one knows how to spell the names of one of the most famous people of the 20th Century and one of the most famous racetracks in the United States, I am writing this blog in their honor. Here is to you, Winston Church Hill. Here is to you, Churchhill Downs. May your names live on. Winston Church-Hill to you, bub. I am the proud owner of an original 1974 Winston Church-Hill Historical Figure. He stands next to my original 1974 FDR figure, who is next my favorite original Eleanor Roosevelt figure. Her hat keeps falling off. Maybe she has trouble keeping her balance on the edge of the hill? I didn’t know the racetrack was named after Winston. I always watch the Derby, but now I’ll watch it smugly know a little more of it’s historical link. Here’s to Winston. Church-Hill. It bothers me that people do not know how to spell.. Those historical figures you have sound interesting. You should write a post about them. I will. It was an outgrowth of collecting dolls. I started hunting for movie star figures for Garry — I got him two John Waynes (cavalry and cowboy), plus Humphrey Bogart, James Cagney, Marilyn Monroe, Audrey Hepburn, and others. I had many many more, but I sold a lot of them. It was, after all, a business. My son has a pair of Blues Brothers I found. They are very rare. Then I discovered U.S. Presidents, but customers (I had an online collectibles and antiques shop) kept buying them. Oh, and First Ladies (very cool). I kept a George Washington and Abraham Lincoln, but sold all the rest. I never put the other historicals and authors up for sale, though I gave a few to close friends and a few others as charity auction items. The historical figures are my favorites. I talk to them, sometimes. So does Garry. FDR and Winston were pals, so they stand next to each other. They can share memories at night, when we are asleep. Dang, you could write a story about their conversations. Throw a little John Wayne in there, too. I could never omit The Duke. I think that few would argue that Winston Leonard Spencer Churchill was probably the greatest Briton of all time. I know that I can say this with some confidence because in 2002 the BBC conducted a nationwide poll to identify who the public thought this was. The result was a foregone conclusion of course and Churchill ran away with the competition and topped the poll with 28% of the votes. 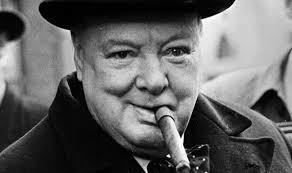 Winston Churchill was so great that he was awarded a State Funeral and that doesn’t happen very often because this requires a motion or vote in Parliament and the personal approval of the Monarch. A State Funeral consists of a military procession using a gun carriage from a private resting chapel to Westminster Hall, where the body usually lies in state for three days. The honour of a State Funeral is usually reserved for the Sovereign as Head of State and the current or past Queen Consort. Very few other people have had them: Sir Philip Sydney in 1586, Horatio Nelson in 1806, the 1st Duke of Wellington, 1852, Viscount Palmerston in 1865, William Gladstone, 1898, the 1st Earl Roberts of Kandahar, 1914, Baron Carson in 1935 and Sir Winston Churchill. I have always been amazed by the strength of Churchill and the British people as they were being bombarded during the Battle of Britain. They were standing alone against Nazi Germany. If they had not held, then history would have turned out completely different. I have wondered about that. Britain would have been occupied that’s for sure but Hitler would still have invaded Russia and Japan would still have bombed Pearl Harbour. Britain would have been liberated by the Americans and the war would have lasted a few months longer. Perhaps? There are a lot of alternate histories positing these and other theories. Suffice to say, we’ll never know. Harry Turtledove wrote a huge series of alternate world and American history, starting with the premise that the Confederacy won the Civil War and takes it from there. It’s fascinating stuff.